A twisted leading edge rudder improving the hydrodynamics of the vessel (optimisation of the water flow), and significantly reducing energy expenditures as well as CO2 emissions. A Pre-Swirl Stator® allowing the straightening up of the water flow upstream from the propeller in order to improve its productivity. Combined with the twisted leading edge rudder, this innovation optimizes the hydrodynamics of the vessel and makes it possible to reduce by 2 to 4% the consumption of energy and the atmospheric emissions. An “Exhaust Gas Bypass” system, which improves the energetic efficiency of the vessel, reducing the fuel consumption by 1.5% at low speeds. An optimized hull design allowing to sensibly improve the propulsion of the vessel into the water. A ballast water treatment system, in order to preserve the biodiversity of the oceans by not rejecting chemicals into seawater. Since 2005, the CMA CGM Group has reduced its CO2 emissions by 30% and set a new target of 50%. 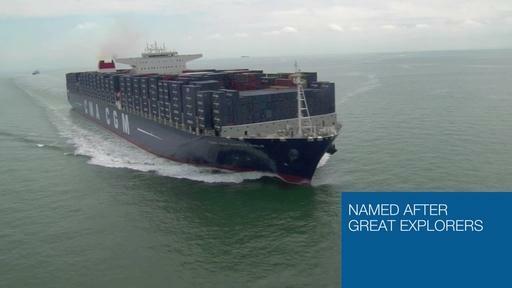 The CMA CGM Marco Polo is an integral part of this strategy!